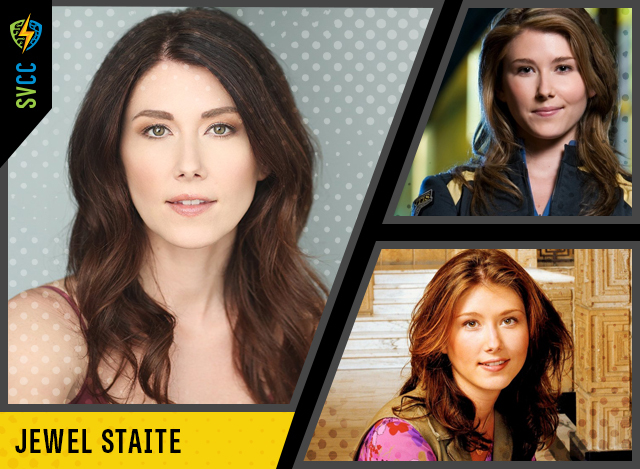 Jewel Staite starred as ‘Raquel’ in the CW series “The L.A. Complex”, which premiered in the Spring of 2012. Prior to that, she was seen starring in the Hallmark Channel telefilm “Call Me Mrs. Miracle” opposite Doris Roberts. This premiere was the highest rated Hallmark Channel telecast of the year. Prior to that, Jewel was seen as ‘Dr. Keller’ in the SyFy Channel hit series “Stargate:Atlantis”. Her stellar work has earned her rave reviews, as well as recognition from The Gemini Awards (Canada’s prestigious equivalent of our Emmy) with a nomination for ‘Best Performance by an Actress in a Continuing Leading Dramatic Role’ in 2008. This was followed up with a nomination from the Leo Awards in 2009 for ‘Best Lead Performance by a Female in a Dramatic Series’. At the age of six, Jewel began studying at the Vancouver Youth Theatre where she trained several days a week for several years. This hard work paid off when she booked the lead role in the Disney Channel series “Flash Forward” with Ben Foster. Her performance earned her a nomination from The Gemini Awards for ‘Best Performance in a Children’s or Youth Program or Series’, as well as a nomination for the Canadian Television Film and Showcase Award. Jewel made her 2005 feature film debut in Universal Pictures “Serenity”, Joss Whedon’s adaptation of the FOX science fiction television series “Firefly,” of which Jewel was a series regular. Jewel played the ship’s mechanic ‘Kaylee’, a sweet, happy and sensual farm girl who loves life and is a genius at fixing anything. Additionally, Jewel has several TV series under her belt including Fox Family’s “Higher Ground” with Hayden Christensen, a recurring role on the highly praised FOX series “Wonderfalls,” NBC’s “Just Deal” and Nickelodeon’s “Space Cases.” Her MOW credits are just as impressive, with starring roles opposite James Brolin and Natasha Henstridge in Lifetime’s “Widow on the Hill”, Showtime’s “Damaged Care” opposite Laura Dern, as well as SyFy’s “Mothman” and “Doomsday Prophecy.” Some guest appearances include the CW’s “Supernatural”, her memorable role in the Showtime pilot “Huff “ with Hank Azaria and Oliver Platt, Syfy’s “Warehouse 13”, as well as Showtime’s “Dead Like Me” opposite Ellen Muth and Rebecca Gayheart, and FOX’s “The X-Files” opposite David Duchovny.